CAMBRIDGE, Mass. - Senior tri-captain Reagan Rust scored in the fourth round of a shootout to send the No. 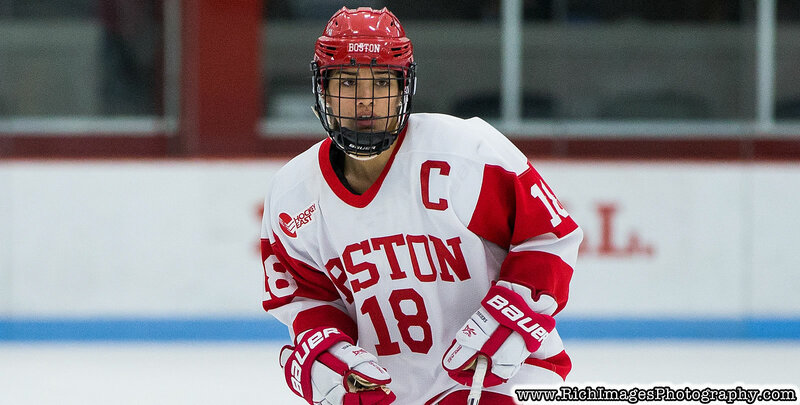 8 Boston University women's ice hockey team past No. 3 Northeastern and into to the title game of the 41st Women's Beanpot on Tuesday night at Harvard's Bright-Landry Hockey Center. After BU (15-6-7) and Northeastern (20-3-4) played to a 3-3 tie, a shootout decided which school would advance to next Tuesday's title tilt. With the Huskies leading, 1-0, entering the third and final round, sophomore Nara Elia deked Aerin Frankel and scored to keep the shootout going. Sophomore Corinne Schroeder (31 saves) stoned Veronika Pettey, Rust beat Frankel with a shot to the top right corner to send the Terriers to their second straight Beanpot championship round. Redshirt junior Sammy Davis led the Terriers with a goal and two assists while sophomore Jesse Compher notched the game-tying goal and also added an assist. Freshman Mackenna Parker lit the lamp as well for BU. Juniors Abby Cook and Breanna Scarpaci both had assists as well. BU, which extended its nation-leading unbeaten streak to nine games (7-0-2), will face either Harvard or Boston College next Tuesday in its quest for its first Beanpot trophy since 1981. - Northeastern opened the scoring 11:28 into the first to take a 1-0 lead into the intermission. - Parker evened the score just 3:41 into the second stanza. Davis cycled the puck to Scarpaci at the left point. Parker and Compher were both stationed in front of Frankel, and Parker deftly redirected the puck past the netminder for her 10th goal of the season. - After the Huskies regained the lead with a power-play strike at 6:50, BU responded with a power-play marker of its own less than five minutes later. Frankel stopped Cook's initial shot from the top of the zone, but the rebound popped right to Davis, and the tri-captain deposited the puck into the vacant cage. - Northeastern scored just 17 seconds into the final frame to make it 3-2, but Compher responded just 1:55 later. Davis forced a turnover in the neutral zone, poking the puck forward to Compher. The sophomore skated past her defender and roofed a shot past Frankel. - Compher nearly made it 4-3 as a Terrier power play expired late in the third, but her shot rang off the left post. - Alina Mueller nearly won it for Northeastern at the start of overtime, but Schroeder kicked out her left pad to make the save, one of her six stops during the final five minutes. - Davis recorded her fifth straight multi-point game thanks to her goal and two assists. - She has notched five goals and eight assists in that span, including seven points (2g, 5a) in the last two tilts. - Compher, who leads Hockey East with 48 points, recorded an assist for an NCAA-leading 23rd different time this season. - Friday was also Compher's 16th multi-point game of the year, which is tied for second-most in the country. - She extended her point streak to nine games on Tuesday, having totaled 16 points (4g, 12a) in that span. - Parker has lit the lamp in two straight games and in five of the last seven contests. - Cook extended her point streak to six games (1g, 6a). - Scarpaci has an assist in each of her last two tilts. - This was the first time the Terriers were in a shootout since Feb. 13, 2010, when they defeated the Huskies in a Hockey East contest. - Prior to next Tuesday's Beanpot championship, the Terriers will host Holy Cross on Saturday, Feb. 9. - Puck drop at Walter Brown Arena is set for 3 p.m.